We all love to have a good old flutter from time to time, and I am certainly no exception to this rule. Whilst it’s not all that complicated, there are definitely a few things to consider to gamble effectively and have the most fun. Apart from choosing whether you like poker, blackjack, the slots, or any other game available, there is another, much bigger thing to consider – do you play at a real life casino or play online? With much debate about where is the best place to gamble, I thought I’d break down my thoughts on both options and let you decide from there. There is no denying that real life casinos are undeniably the originators of gambling. With a history thought to hail back to around 1638, the casino is a long standing tradition with millions of people worldwide – and so it should be. With the flashing lights, the excitement and the crowds of people playing in the hope of that big win, the energy is always exhilarating. Add to that the huge selection of slot games, gaming tables, charismatic dealers, and screams of encouragement when you are on a streak, and the real life casino is most definitely a great night out for all avid gamblers. Ok, so it’s no secret that I have my own online casino, and whilst it may seem like I’d be a little biased, I am actually a big fan of both options. Real life casinos have the all the fanfare and excitement of crowds, but they also have all the fanfare and excitement of crowds! No, I am not losing my mind and repeating myself, I simply mean that sometimes the last thing you want is a huge crowd when you feel like a flutter. Personally, I love to have a spin through the reels sitting on my couch, sipping a beer in shorts and a tee shirt – this look doesn’t usually fly at a casino, and is only the start of the advantages of online gaming. 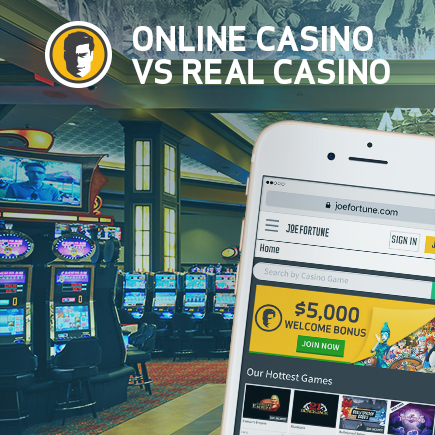 Live too far away from a real life casino – no problem, go online. Have a family that means that you cannot leave the house for a flutter – no problem, go online. Got a huge amount of chores during the day and can’t get more than a few minutes here and there – no problem, go online. Online Casino vs Live Casino, which is better? There really isn’t a ‘better’ option when it comes to gambling online or in a real life casino. If you fancy a big night out with friends once in a while, then of course going to the physical casino is going to win out over crowding around a laptop, but for every other time online gaming is by far the easiest and best option. There are no crowds, you can wear what you like, and you can gamble from literally anywhere on your phone or laptop. So, so easy. Simply put, it is all about convenience and accessibility, and with an online casino there is an abundance of both.